Pre-owned Juniper MX10 routers are a step above Juniper’s entry-level MX5 routers. MX10 routers are designed for enterprise and service provider networking environments, just like the MX5 router. The MX10, however, outperforms the MX5 in almost every way. The MX10 router is a tier above the MX5 within the MS Series of routers. It’s 2 rack units (RU) in size, and it’s designed as a fixed-configuration router. Despite sharing some characteristics with the MX5, the MX10 features more advanced specifications, including a higher maximum capacity and a greater number of ports. 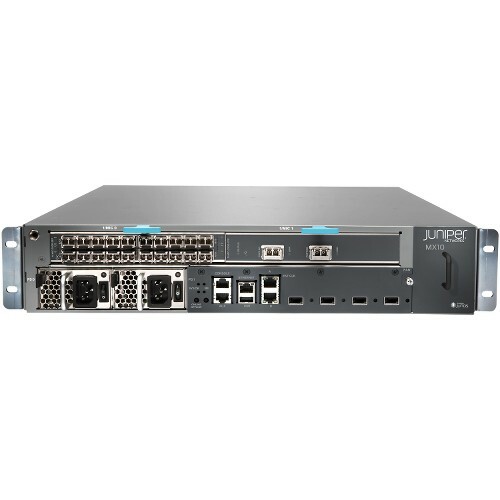 Pre-owned Juniper MX10 routers have three Modular Interface Card (MIC) slots. Two of the MIC slots are located on the front of the router, and one is on the back. Whereas only one front MIC slot is available on the MX5, both front MIC slots are available on the MX10, allowing for some customization in setting up port configurations. The slot on the back is solely for a Multiservices MIC (MS-MIC), which manages specific processing duties. The MX10 supports up to 10G Ethernet and has a maximum capacity of 80 Gbps. Review the chart below to see how used MX10 routers compare with other pre-owned Juniper MX Series fixed-configuration routers. We also have PDF datasheets that include more in-depth specifications for used MX10 routers and other Juniper MX Series routers. If you’re interested in reviewing our datasheets, please contact us and we’ll get you the information you’re looking for. We sell the highest-quality Juniper MX10 routers at a price point that’s especially cost effective for medium- and large-sized businesses. We’re able offer lower prices than our competitors because we are an in-stock dealer of pre-owned Juniper MX10 routers. We also purchase used Juniper equipment in bulk, which helps drives down our prices further. By purchasing used Juniper MX10 routers from BrightStar Systems, you don’t have to worry about whether or not your equipment is going to work properly. We test every piece of hardware we stock to ensure it’s operating at peak performance. Our quality control tests cover the basics, such as verifying serial numbers, and include advanced examinations, such as making sure devices are able to run for at least an hour after reaching full operating temperature. If you’re interested in learning more about our in-stock used MX10 routers, or would like us to send you a quote, please reach out to our sales team. We aim to offer the best purchase price for your used Juniper MX10 routers. Not only that, but we want to make it as easy as possible for you to ship us the equipment you’re selling. That’s why we cover all costs for both domestic and international shipping. We can even schedule a freight pickup at your convenience for large shipments. It doesn’t matter if you’re an enterprise, a service provider or an individual, we’ll give you top dollar for any used MX10 routers we purchase. And if you need the payment up front, we can pay in advance using several secure electronic payment methods. If you have pre-owned Juniper MX10 routers you’re looking to sell, please contact us and we’ll get the process started right away. It’s important to us that you get the most value out of your used Juniper MX10 routers. It’s also in our best interest as a vendor of in-stock pre-owned MX10 routers to collect detailed information on the equipment you’re selling; it streamlines the selling process, and enables us to send the most accurate offer right from the start. Our sales process is set up the same way. We collect information on the used Juniper equipment you’re looking to purchase, and then we quickly respond with a quote that approximates the final price. In addition to supplying best-in-class used Juniper networking hardware, we provide great service and a long-lasting protection plan. Our trained team of sales associates and engineers are here to help you through every step of the sales process, including purchasing, shipping and installation. Every used surplus MX10 router we sell comes with BrightStar Systems’ 1-Year In-House Warranty as well, so you can purchase your equipment knowing it’s protected for an entire year. Our team is here to answer all your questions about our used Juniper MX10 routers and any other in-stock pre-owned Juniper MX Series hardware. Contact us today. Pre-Owned MX10 routers for sale. Read more about Juniper MX10 specs with the suggested downloadable PDF datasheet. Contact us about preowned MX10 routers with a BrightStar Systems’ 1-Year In-House Warranty. We buy and sell used Juniper networking equipment. Please contact us to buy or sell any pre-owned or surplus Juniper routers.